Things to do in Rochefort Visit Rochefort for the weekend and submerge yourself in a town whose glorious marine history seeps from every corner. Rochefort is the gateway to the Charente estuary, the ocean and islands. This beautiful city invites you on a maritime journey of adventure and far-off horizons. Here, we let you in on how you can soak up the ambiance and must-see sights of this official “Town of Art and History” over two days. The starting point for our great escape is the Porte du Soleil, a triumphal arch decorated with maritime trophies. Head towards the Marine Museum. This stunning building, dating from the 17th century and the oldest in the town, is home to miniatures and models explaining the history of the military dockyard, which produced 550 warships. Don’t miss the full-scale replica of the Raft of the Medusa! Now it’s time to see the most famous frigate. 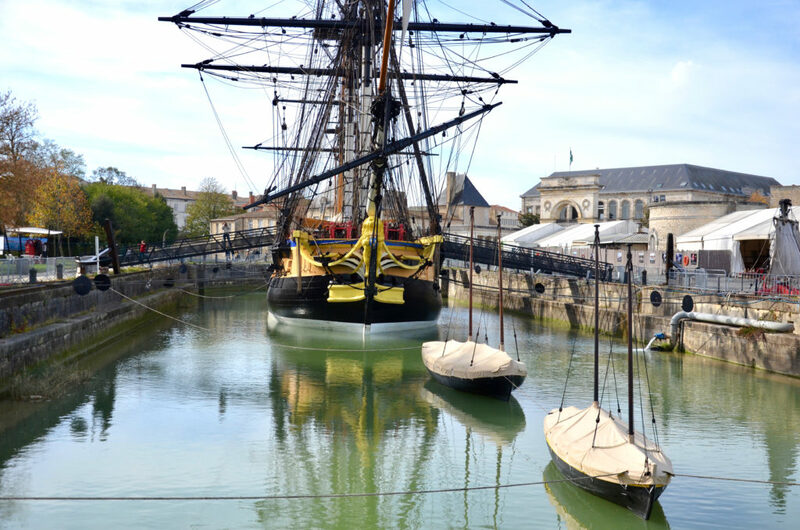 The Hermione (which set sail on the Mediterranean and returns to Rochefort on 16th June) is a majestic flagship that shines a light on the job of a boatswain. Explore the rigging by having a go on the Accro-Mats, a unique experience that’ll have you reaching for the sky. Now it’s time to discover the Royal Ropery, a majestic building that stands 374m tall. This royal factory, commissioned by Colbert, could produce a cable length’s rigging (almost 200m) in one single piece. The International Sea Centre within the Royal Ropery tells the building’s exciting and fascinating story and invites you to discover the laying and boatswain’s workshops. After a gourmet lunch, it’s time for a nice walk around the Jardin des Retours, a garden where the royal vegetable plot runs along the Charente River. Next up is a surprising voyage into the world of anatomy at the Naval and Tropical Medicine School, the first in the world to train the surgeons who travelled on warships. Midday is the perfect time for sunbathing on the terrace in Place Colbert. The famous square, which served as the backdrop for the famous French musical The Young Girls of Rochefort , lets you follow in the footsteps of Delphine and Solange and discover the inspiration and shooting locations used by filmmaker Jacques Demy. Now head to the Museum of Historic Brands, or experience a 3D tour of writer Pierre Loti’s house at the Hèbre Museum. After dreaming of adventures on every street corner, you’ll fancy setting off on a voyage of your own. 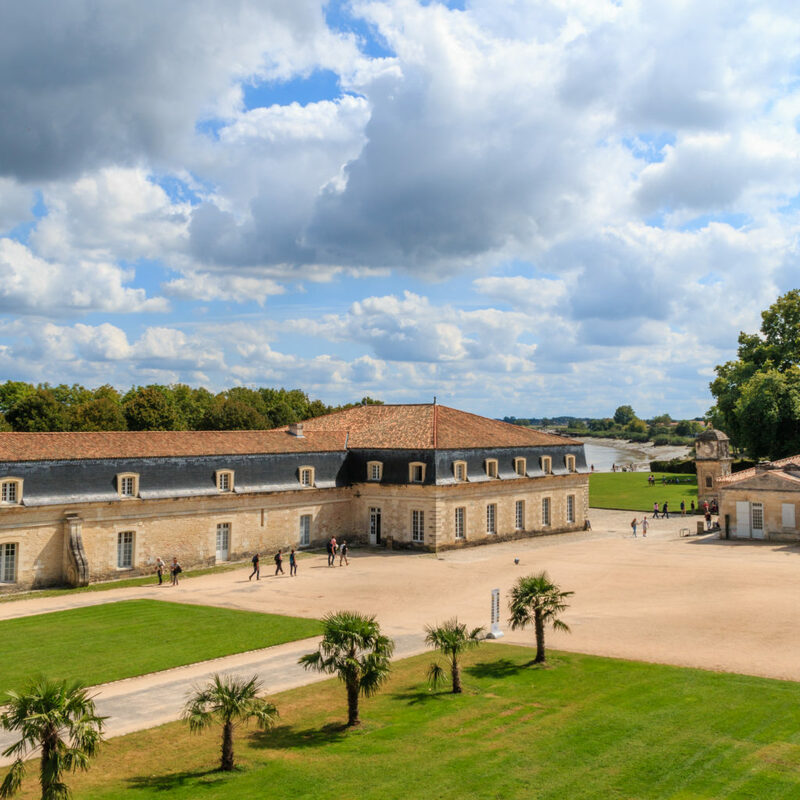 Embark at the pontoon at the Royal Ropery and set sail for Île d’Aix! We sail peacefully along the last meanders of the Charente River, past the Transporter Bridge (the last of its kind in the country), while the marshlands of this “Grand Site de France” slip by, a playground for otters, herons and other wading birds. A network of forts soon appears: Fort Lupin and its crenelated walls to the port side, and Fort La Pointe to the starboard side. We cross the harbour bathed in a unique light, past the forts of Île Madame, Vauban, l’Aiguille and Enet, before coming across the most famous example of its kind, built on a sandbank between the islands, Fort Boyard. 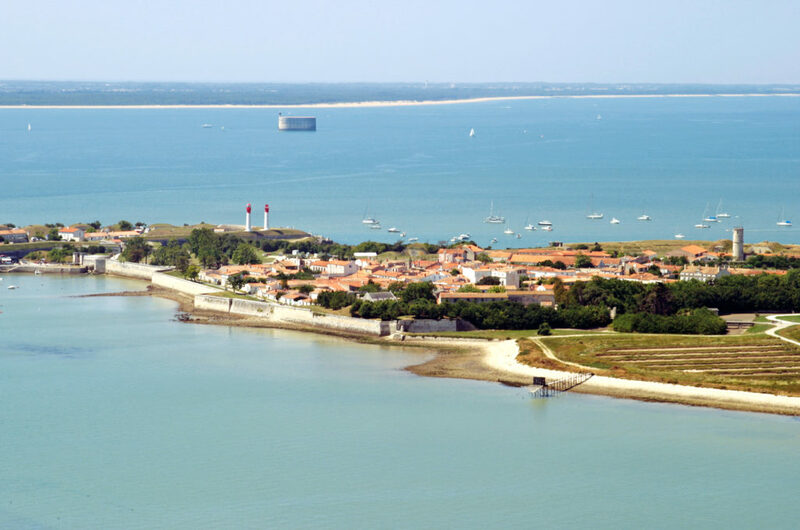 Once we’ve skirted the fort, we see the silhouette of the Île d’Aix lighthouse and its twin tower. We disembark onto this small, timeless sliver of land measuring 3km by 700m, and make our way to the Napoleon Museum to find out more about the island’s most illustrious guest, who would leave such an impression during his first visit in 1808 and his last before his exile to St Helena. After lunch in the salty sea air, it’s time for an invigorating bike ride around the island. Forts and ramparts stand alongside golden sands, wild coastlines and a forest planted with exotic species, as well as oyster farms and vineyards. It’s all here. At the end of the afternoon we set sail again for Rochefort. We’ve been blown away, and it’s left us wanting more. A date’s already been set for this August: the magnificent setting of the Royal Ropery will welcome the planet’s biggest DJs and new talent for the Stéréoparc festival. We don’t have to wait long until we join in this energising electro atmosphere.